Now that SF Pride is over, I feel like a kid the day after Christmas vacation: gluttonous, a bit sad, but thoroughly satisfied. Today’s writing prompts reflect some of my thoughts this past week. They are followed by a simple recipe for pie crust. A year ago, I posted a recipe for a strawberry and blueberry galette (click here for that recipe). In that post, I mentioned I had a simple recipe for pie crust as well, but like a baking tease, I never gave it up, so here it is. My recipe includes half butter and half Spectrum shortening (this is vegetarian and non-hydrogenated: skip the butter-flavored one and go for the plain one in the blue and white container). This recipe makes enough for two open pies, or a bottom and a top crust for closed or latticed pies. Mix dry ingredients with a whisk, or in the food processor. Add shortening and butter, cutting through with a pastry cutter, two knives, or pulse in a food processor, until the dough resembles small, course pebbles. Add vinegar and water, then pulse again (or mix) until dough just comes together. Remove from the fridge and let the dough warm up for about 10 minutes, then using a rolling pin, roll the dough out into a circle on a well floured cutting board, turning the dough often to get it as even as possible. If the dough cracks at the edges, simply fold the cracked edges over one another and press together. If the dough is too sticky, roll it into a ball, then roll it through a little flour. If the crust is too dry, add a few drops of water, working more water into the dough until it is more pliable. Make sure to get the crust nice and thin (about 1/8 of an inch is perfect, but roll it as thin as you can without it tearing). Most people make the dough too thick, which makes it tough and gummy. Too thin, and it will split. Play with this. The only way to know how to do this well is to try it a few times. Once you’ve baked the crust, you’ll find your own desired thickness. 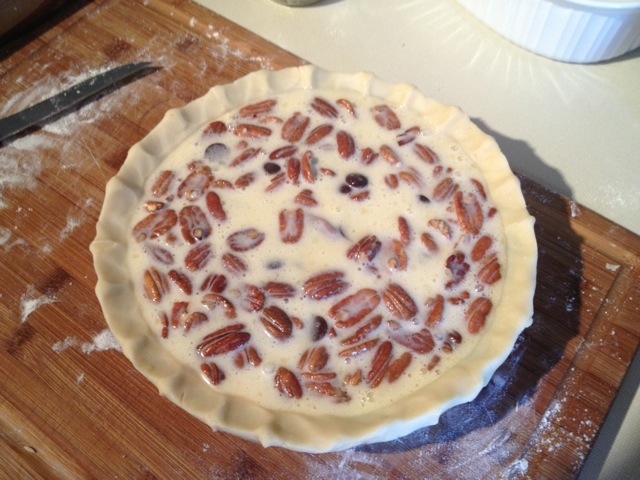 Gently lay the crust in the pie pan, and trim the edges with a sharp knife, so you have a relatively even circle, but be sure to leave about a half inch of overhang. Take that overhanging crust and fold it under, making a thicker edge. Using your thumb and forefingers on each hand, pinch the crust together to form little peaks (see photo above). You can also fold the overhanging crust under and press it with a fork all the way around, which produces a nice design on the edge of the crust. Fill pie and bake as directed by your pie recipe. If you need a baked pie crust for a cream pie, poke holes in the crust with a fork, and bake at 450 for 10 minutes.